Now I can say, "I love Rieslings!" White wines are predominant in Moravia, and Riesling and Welschriesling are two of the more common varietals. 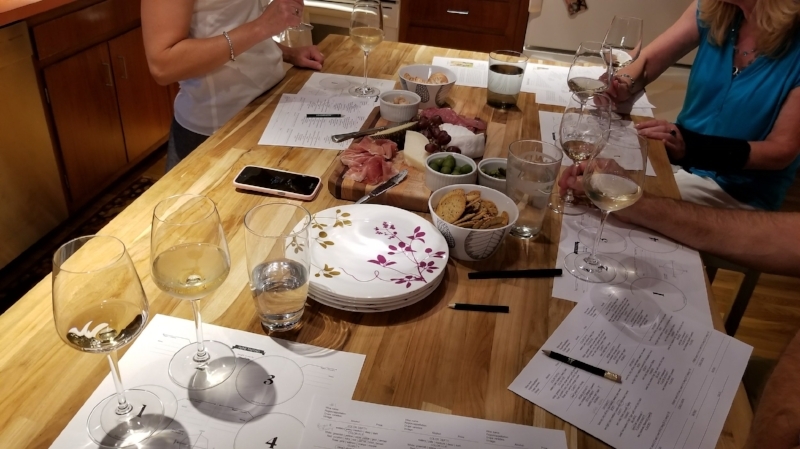 Being most familiar with what they call Ryzlink rýnský (Rhine Riesling, or “Noble” Riesling - the one we see most in stores here in the States), we were pleasantly surprised to taste their Ryzlink vlašský - or Welschriesling - which were delightfully fresh and flavorful. All of a sudden it was a whole new world of Rieslings! Now in full disclosure, I personally have never been a fan of Rieslings - at least of the Rieslings I had tried up until now. Heidi was insistent that there were true dry Rieslings, but each time I tried one labeled as such, it still had a sweetness to it that just wasn’t really appealing to me. My personal preference is for dry - ideally bone dry - white wines, which sometimes can be difficult to find in common stores and restaurants. So I really was just beginning to think she was messing with me (that would be just like her). However Moravia has indeed changed my preferences and I can now confidently say, "I love Rieslings!" In fact, it changed my opinion about many varietals, but more on that later. A little thing to know about Riesling and Welschriesling - they are completely unrelated. While Riesling is grown in not only notable European regions like Germany, Austria, and Italy, it is also common in Australia and New Zealand as well as the United States and Canada. Welshriesling however is almost exclusive to Central Europe in countries such as Croatia, Hungary, Austria, and of course, Czech Republic. The Moravian Rieslings of the Czech Republic are some of the best wines coming out of the region right now. The dry style is very distinct and delicious, and they are gaining international recognition - a Moravian Riesling won best Riesling and best white at the 2014 SF International Wine Competition over 1500 other white wines from around the world. Nothing fancy here - just bottles in bags! So it is fitting that our first blind tasting of the Moravian wines brought back (in our suitcases!) was of Rieslings. Each of the four tasted (plus a bonus bottle! ), were so unique and different from each other it was clear the magic was in the winemaker's approach and style that made each wine stand out. We are excited for both the Riesling and Welshriesling that were the leaders of the group. I think those who love traditional Rieslings will find these refreshing and easy to drink. And for those like me - with a little leap of faith, trying one of these might make you say “I love Rieslings” too! The Wine Guide for Beer Lovers - Get Your Beer Drinker to Try Wine!